As we head into the summer season, AKA the season of light reading and lighter beverages, I wanted to take our Real Reads book club in pretty much the opposite direction as our last book. Instead of finding our life’s purpose, let’s just figure out which wine we like best, emkay? Wine. All the Time. by Marissa A. Ross is just the book to help us answer this question. I am by no means a wine connoisseur. I go by the old adages of white wine in summer, red wine in winter, and rosé if you’re a newb or a twenty-something. If you’re on Instagram, you already know I’m way wrong about the rosé. Turns out I’m wrong about all of it. After a three-credit college course in wine and spirits (I know… It was as cool as it sounds. ), I have always been overwhelmed when it comes to ordering wine at a restaurant or even just trying to narrow down the selection at the grocery store. I’ve stayed away from real wine shops and liquor stores because I didn’t want to look like a total novice. No more! 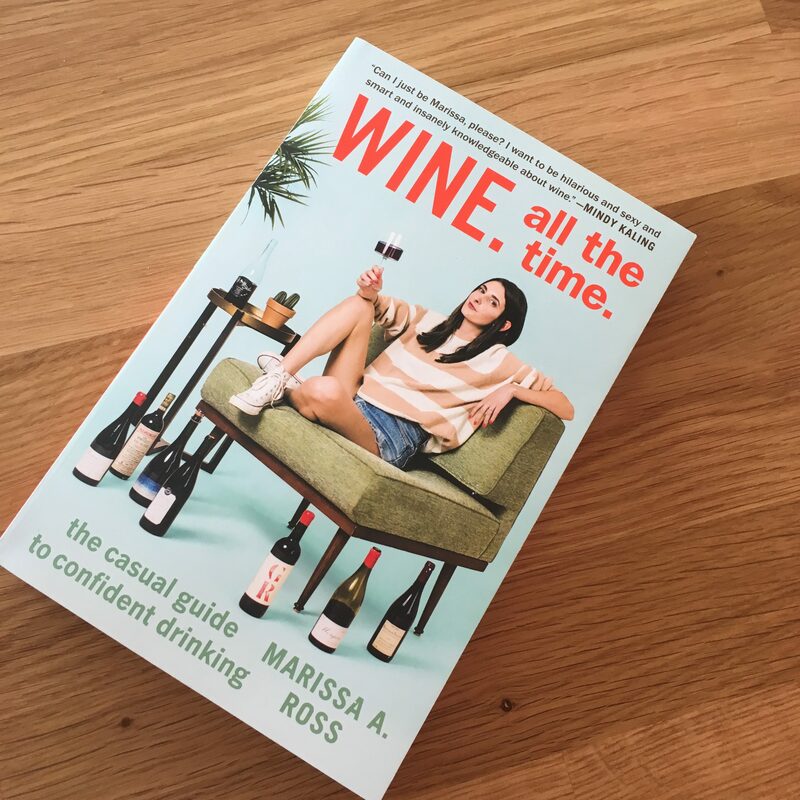 Marissa Ross’ book makes wine so approachable. As a “college dropout comedy writer”, she definitely didn’t go to school for this. Instead, she’s learning on the job. (That job being the wine columnist for Bon Appetit magazine.) In this book, she breaks down the basic lingo, regions, grapes, and all the other details you might want to know about what you’re drinking. Additionally, she skips over to important topics like what kind of wine to get for your super religious aunts, steak-loving dads, or just for yourself when you’re feeling sad. You know, the important stuff. Last summer I took this book to Thief Wine in Shorewood and together they made me realize I love white wine from the Vouvray region of France, Beajoulais doesn’t do it for me, and Tempranillos from the Rioja region of Spain are my jam. I still nodded my head in befuddlement this last visit when the salesperson told me it was a good thing that a wine had a petrol finish. (Wait, isn’t that gas??) But at least I’m confident enough to try something new. So check out the book and let us know what wines are your favorite. We will get together for the Real Reads book club sometime in June. I’m still trying to figure out if we do a field trip to a wine shop or (shh!) have a gathering here in the kitchen where we all bring our favorite bottle to sample. Stay tuned!